US-backed forces battling Islamic State in Syria say they have launched their final assault on the jihadists’ last pocket of control in the country. “Nothing remains in Baghuz except for terrorists,” a spokesman for the Kurdish-led SDF alliance said, referring to the IS militants. The village in eastern Syria has been besieged by the SDF for several weeks. The offensive was delayed to allow thousands of civilians, mostly women and children, to be evacuated. 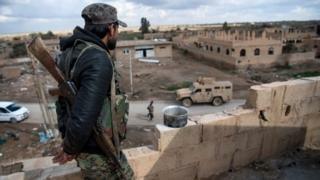 SDF (Syrian Democratic Forces) spokesman Mustafa Bali said his forces moved into the village, which lies on the eastern bank of the Euphrates river near the Iraqi border, at 16:00 GMT – after the final batch of civilians had left. “We expect a fierce and heavy battle,” he told Reuters news agency. Mr Bali declined to speculate on how long the final push might take, but the SDF said on Thursday it expected a final victory within a week. Baghuz is the last territorial stronghold IS has in Syria. Its fall would be significant, but experts warn that the group will continue to remain a security threat as long as its ideological pull endures. About 20,000 civilians have been taken by the SDF to a makeshift camp for displaced people at al-Hol, in Hassakeh province, in recent weeks. Among them are the wives and children of IS militants and many foreign nationals. A number of men belonging to IS have also surrendered in recent days. Some were found with hidden weapons during their surrender, according to pro-SDF Kurdish Ronahi TV. Hundreds of other IS militants remain in Baghuz but an exact number is unclear. On the messaging app Telegram, IS supporters have launched a hashtag campaign calling for divine intervention in support of the jihadists. At its height, five years ago, IS controlled 88,000 sq km (34,000 sq miles) of territory stretching from western Syria to eastern Iraq. The SDF says the jihadist group has now been contained to an area of less than half a square kilometre. Thousands of refugees have been returning home as gains have been made against IS. Kurdish authorities said a group of 21 Yazidi women and children returned to Iraq from Syria on Friday after more than four years in captivity. IS militants killed or kidnapped more than 9,000 members of the minority religious group in what the United Nations has called “genocide”.